Created. The note's $Created attribute value. By. The note's $Creator attribute value. Modified. The note's $Modified attribute value. Characters. The note's $TextLength attribute value. Words. 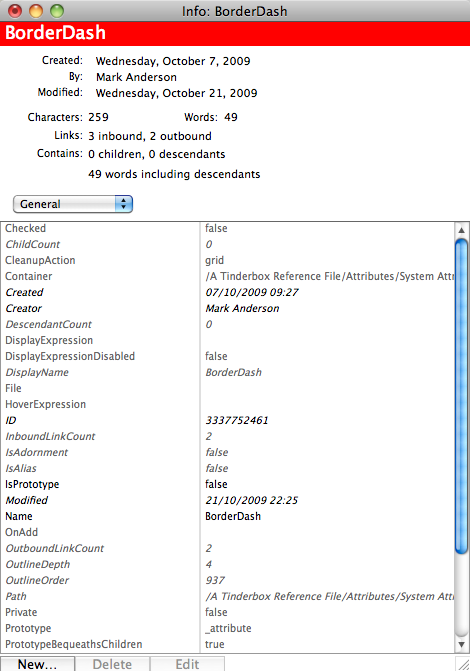 The note's $WordCount attribute value. Links. The count of current links inbound to and outbound from this note. Contains. The note's $ChildCount and $DescendantCount attribute values. Words including descendants. The cumulative $WordCount attribute values for this note and its descendants. Attribute Group list (pop-up). This lists the various groups of attribute types (General, Map, User, etc.). The default selection is the User attribute group. The current selection's members are displayed in the lower part of the dialog. Inherited values are drawn in grey whilst values set specifically for this note are drawn in black (for example, the 'number' value of the 'AttributeDataType' attribute). NOTE: Displayed value boxes only support the MacRoman character set - Unicode data may not display properly although underlying Unicode data is not affected as long as the data in box is not edited/saved. New… Only available for User Attributes. This opens a Create Attribute dialog and results in a new attribute. Delete. Only available for User Attributes. This immediately (no warning dialog) deletes the selected user attribute. Edit. Opens the Edit Attribute dialog and allows the attribute name, data type and default value to be edited. For System attributes only the default value may be changed. System attributes inheriting a default from Preferences can only be edited via the relevant Preference pane. Use Defa… Use Default. This immediately (no warning dialog) sets the stored default value for the attribute. Edit. Edit the current attribute's value via the Edit Attribute Value dialog. Read-only attribute values may not be opened for edit, but may be copied - select the right-hand column value box and use Cmd+C to coy the value. Double-clicking boxes in the attribute lists starts an edit. Double-click a right-column box to edit this current notes attribute value. Double-clicking the left-column box edits the document-level default value of the attribute, i.e. it affects all notes not just the current one. From v5.10.2, when editing an alias, values for intrinsic attributes are set correctly (previously the original's value was altered).